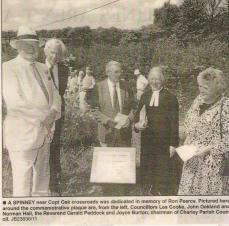 A Spinney of indigenous shrubs was planted at Copt Oak by Charley Parish Council in 1998 in memory of Coun. 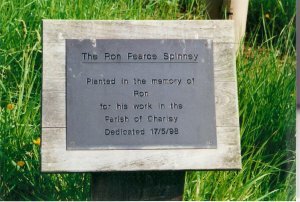 Ron Pearce's service to the Parish. A tree for your parish. 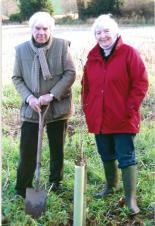 In 2005 an oak sapling was planted by Councillor John Oakland and Councillor Maureen Havers in the National Forest under their scheme "A Tree for Your Parish". 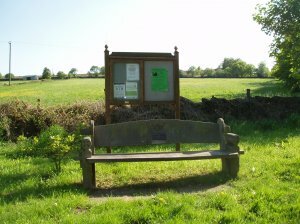 This bench is a replacement and was provided by Charley Parish Council in memory of Norman Hall, a life-long resident and one time member of the Parish Council. Norman spent many hours of his latter years sitting, with his dog, Pip, on the original bench, chatting to passers by. It is situated at the Abbey Road/ Oaks Road crossroads. Bench dedicated to the memory of Norman Hall.